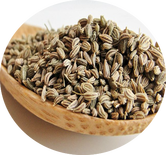 Ajwain seeds are pale, khaki colored and look like a smaller version of cumin seeds. They are highly fragrant and smell and taste like thyme (with a stronger flavor). It is used in small quantities and almost always used cooked because of its strong, dominant flavor. Ajwain is used in vegetable dishes (for its distinctive taste) and pickles (for its preservative qualities). Ajwain has properties that help with digestion. When distilled, ajwain produces Thymol making it a valuable medicinal ingredient in Ayurveda. Amchur is an Indian spice made from green, unripe mangoes. Slices of the mango’s flesh are dried and then ground into a powder. Amchur adds a pleasant acidity to vegetarian cooking in Northern India much like tamarind does in South Indian cooking, and vinegar or lemon juice does in other cultural dishes. Amchur also appears in pickles, chutneys and curries, adding a fruity and sharply sour flavour to its taste. Anardana is the dried seeds of pomegranate too sour to eat as fresh fruit; they have a tangy, fruity flavor. Though used mostly for vegetables and legumes, anardana also flavors Mughal-style dishes. They're a bit sticky and serve as a souring agent in Indian cuisine. 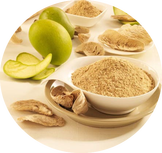 The seeds are roasted, then ground and used instead of lime juice in many regions, especially where it has a cold climate and fresh limes are not available. A large fennel-like plant that grows mainly in south Asia. In the spring, when the plant is about to bloom, the stems and roots are cut, and the milky resin is scraped off. The gummy resin is sun-dried into a solid mass that is sold in solid, wax-like pieces. Most raw asafetida is sent to India for further processing and sale, mostly in powdered form. The powdered gum resin of the asafetida imparts a very strong onion-garlic flavor and is used in small quantities in Indian dishes. The taste is bitter and acrid; however, when fried lightly, it adds wonderful aroma and taste. Black cardamom has a distinctly much more sharp aroma (though not bitter) with coolness similar to mint than green cardamom. In India, black cardamom is felt superior for spicy and rustic dishes and can be used in liberal amounts. There are many distinct varieties of black cardamom, ranging in pod size from 2 cm to more than 5 cm with different tastes. Large cardamom has certain characteristics different from that of small cardamom. 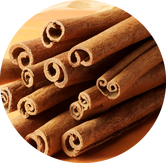 Cinnamon, most commonly used in North American desserts is used in Indian cooking for its warm and slightly sweet aroma. Cinnamon comes in powder, quill or stick form. Cloves are the unopened flower buds of a tropical tree. When fresh, they are pink- though when dried, they turn to a rust-brown colour. The large end of the clove is the four-pointed flower bud. Their flavour is know to be sweetly pungent, astringent and strongly aromatic. Coconut milk is not the juice found inside a coconut, but a further derivative from the cream process. To make coconut cream, finely grated coconut is steeped in hot water until it is cool enough to handle. It is then squeezed until dry; the white fluid is strained to remove all the pulp (coconut cream). More hot water is added to the pulp and the process is repeated to yield a lighter fluid, or coconut milk. Frequently, a third pressing is done to obtain a light coconut milk, which is used for stewing meats or for thinning coconut milk to make a coconut soup or a light curry. 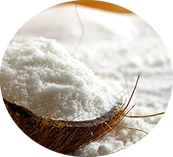 Coconut milk powder brings convenience to the consumer. It's basically a quick and easy way of getting coconut milk by simply adding hot water to it. 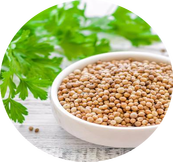 Coriander, more commonly referred to as cilantro in the western world comes in a variety of forms including ground (seeds), seeds, whole and dried. All parts of the plant are edible, but the fresh leaves and the dried seeds are more commonly used in cooking. The leaves have a different taste from the seeds, with citrus overtones. 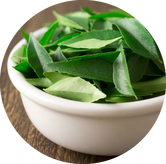 Curry leaves are a subtropical tree native to India. These have a faint aroma which is produced while cooking. Apart from being widely used in medicines, it is also vastly used in many cuisines. These leaves are used extensively in Southeast Asian cooking, adding a very distinct flavor and aroma to an assortment of dishes. 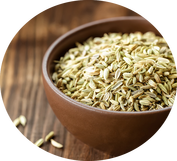 Fennel seed is a highly aromatic and flavourful herb. It is derived from a shrub which is an erect aroma. Fennel seeds are pale greenish in colour and have a faint sweet and refreshing flavour. In most Indian cooking, the use of fresh ginger and garlic is indispensable. Either in the fresh whole form or as a paste, many dishes call for it. 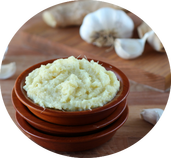 For plain ginger garlic paste, grind the ginger and garlic to form a fine paste. The key is to use equal amounts of fresh ginger and garlic. Garlic is one of the most popularly used vegetables in Indian cuisine. 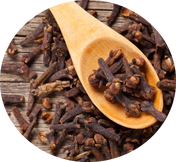 The cloves are used for consumption (raw or cooked), or for medicinal purposes, and have a characteristic pungent, spicy flavor that mellows and sweetens considerably with cooking. 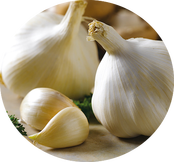 It is usually recommended using raw chopped or pressed garlic in many of the dishes. It is best to add it towards the end of the cooking process to retain the maximum amount of flavor and nutrition. Cardamom, often dubbed as the "grains of paradise" is a pungent, aromatic herb which is very versatile. It is also the second most important national spice of India (the first being black pepper), known as the "Queen of Spices”. Cardamom is one of the world's most ancient spices. 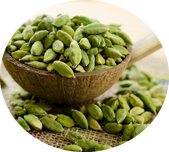 Green cardamom pods are harder to find and more expensive than black/large cardamom mainly because of their superior ability to retain aroma and flavour longer. 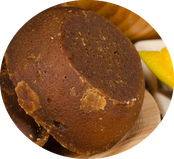 Jaggery is a traditional type of sweetener used in Indian food. It's normally manufactured from either sugar cane or date palm, however it can also be made from coconut or sago palm, thus varying from golden brown to dark brown in color. Many people consider jaggery the healthier substitute for white sugar because it doesn't go through the additional processing that refined sugar does. Instead, the cane or palm juice is boiled to a semi-solid paste, which is then poured into large trays to harden. 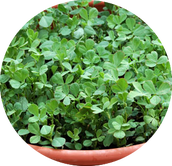 Kasuri Methi is the dried leaves of the fenugreek plant. The dried leaves are used as a herb. It adds flavour and texture to vegetables, pulses and lentils, parathas and chapattis. 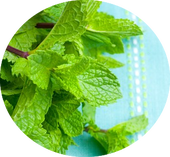 Mints are aromatic herbs that can be used fresh or dried. Fresh mint is usually preferred over dried mint when storage of the mint is not a problem. The leaves have a pleasant freshly sweet flavor with a cool aftertaste. Due to their speedy growth, it's very easy to grow them right in your garden. Simply put, plant the used mint stem deep into the soil, directly in sunlight and give it lots of water. We all know mustard as the popular condiment used to add flavour to western fast foods. But its seeds are being used for an entirely different purpose in regions like India where they're fried to enhance the exotic flavours and aromas of the dish, bringing out the sweetness of the seeds. There are three different types of mustard seeds. The most common being a favourite in Europe and America is yellow/white mustard. They have a balanced and subtle flavour. Then we have our brown/black variety which are smaller and pack a more intense flavour - perfect for Indian dishes. Let's not forget our hot or oriental mustard seeds. Even though they're smallest of the bunch they're great for adding that much needed kick to mild dishes. Saffron is one of those spices that should be used sparingly, as it tends to be rather costly. The spice is actually the dried stigma (tiny threadlike strands) of the Crocus flower. Each stigma is very small, and tens of thousands of individual strands go into a single ounce of the spice. The stigmas are hand-plucked from individual flowers, lending to saffron's high value. Saffron originated in the Middle East, but has been incorporated into Greek, Indian and Spanish cuisines over time. The spice is mainly used to flavour and add natural colour to food, and a little goes a long way so one thread at a time should do the trick. Star anise is a star shaped spice and has a licorice taste. It is the unusual fruit of a small oriental tree. The fruit is picked before it can ripen, then dried for cooking use. 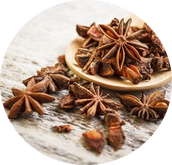 Star anise enhances the flavor of meat and is used as a spice in preparation of biryani all over the Indian subcontinent. 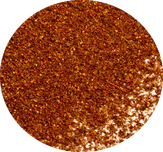 It is widely used in Indian cuisine where it is a major ingredient of garam masala. 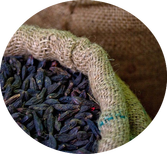 Star anise is also an vital ingredient used in the traditional five spice powder. A cooking ingredient made from the tropical tamarind fruit, which is used for fish, meats, soups, pickles and chutneys. The fruit is large brown pod, which contains small seeds and a brown pulp with a sweet-sour flavor. The fruit is boiled and pulp is extracted from the pods for use in cooking. It has an acidic flavor somewhat like lemon juice. Tamarind pulp adds a distinct sour taste to the hot and spicy preparations and is normally used as the substitute of tomatoes. Before using in cooking, the dry tamarind pulp is soaked in water and the juice is then added to the preparation. Turmeric powder, a bright yellow spice powder is made from dry turmeric rhizomes. 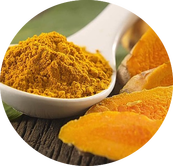 Turmeric is useful for its colour, flavor, cosmetic and medicinal properties. The use of turmeric dates back nearly 3000 years to the ancient Vedic culture of India. Since then, it has been used as an important spice, for cosmetic purposes and in spiritual ceremonies. 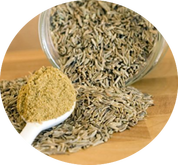 Cumin seeds belong to the parsley and dill family and resemble caraway seeds, though they are different in flavour from them. Oblong shaped, these pale or dark brownish seeds are a very popular spice and are used for their distinctive aroma. This ancient spice is popular in Indian , Mexican, North African, Middle Eastern, and western Chinese cuisines. 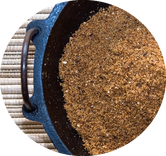 Cumin is one of the most typical spices for India and is sautéed before usage.